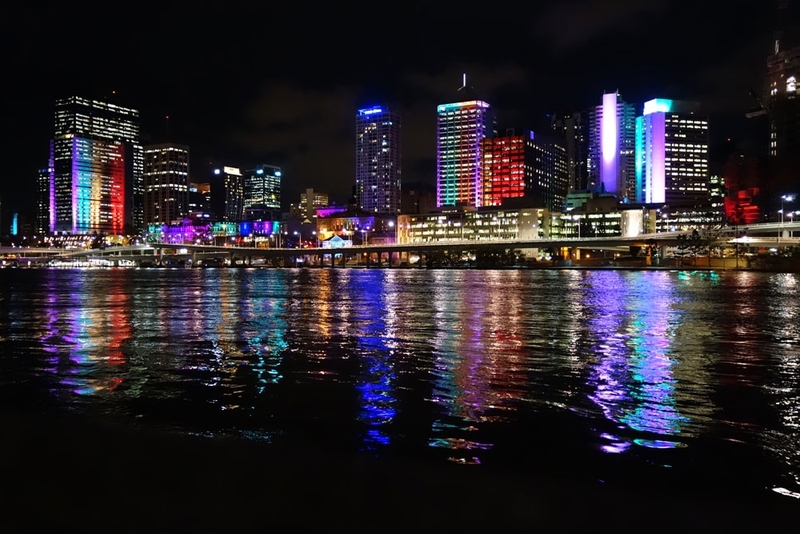 We stopped off on our journey up north to the busy city of Brisbane to check out some of the free activities and go to the outdoor cinema. Brisbane is a lovely city. 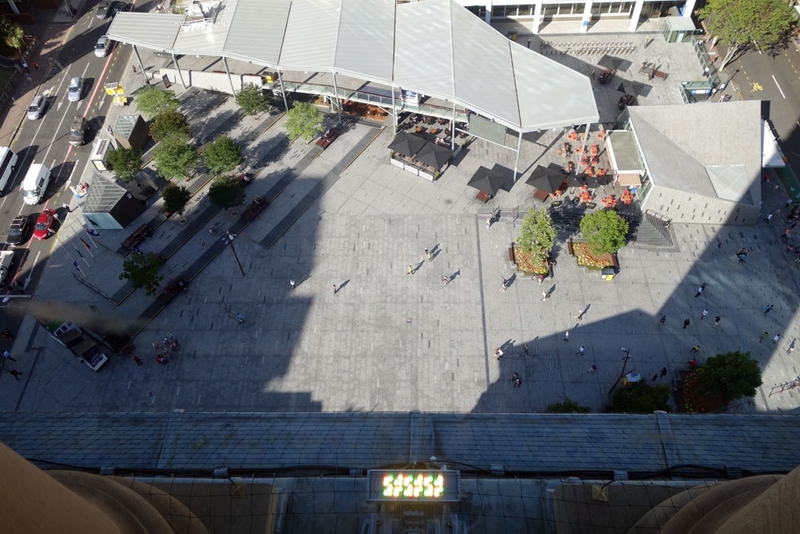 I'm sorry to say that the city centre beat the more build-up Sydney by a considerable margin. As the city prepared itself for the G20 summit we navigated our camper through a labyrinth of closed roads and one-way streets, searching for a parking spot. 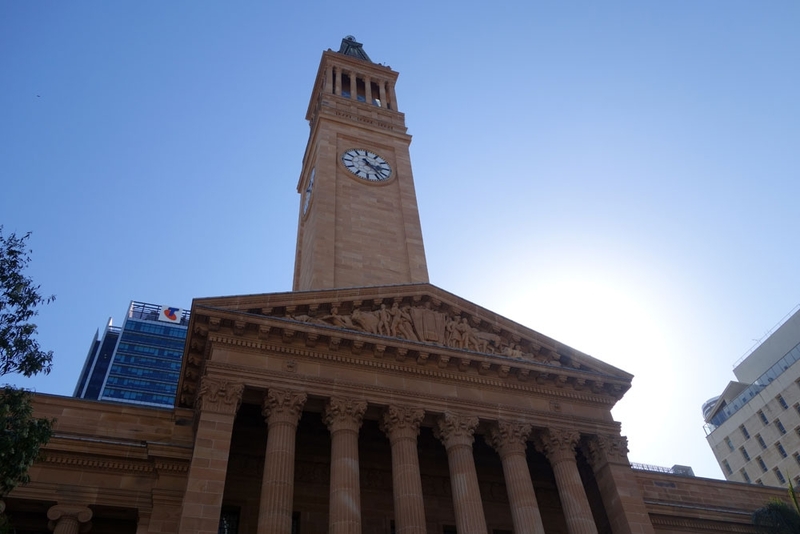 One slight downside to Brisbane, we discovered, is that it is one of the most expensive cities to park in. Road parking was expensive and often capped at 2 or 3 hours, those 9-hour spaces we found didn't have a maximum day-amount either so it was just under $5 per hour (which adds up when you are looking to park all day). 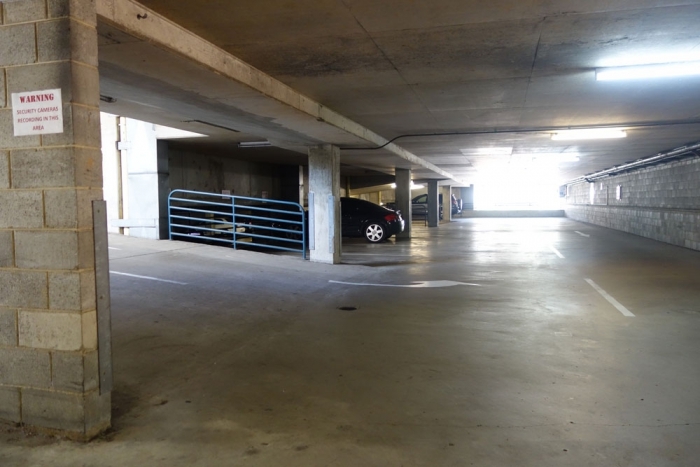 The organised car parks were in the region of $35-$40 per day. There is a lot of complexity with early bird parking and different organisations looking after on-street parking in different parts of the city but from our reading, it is simply an expensive place to park. 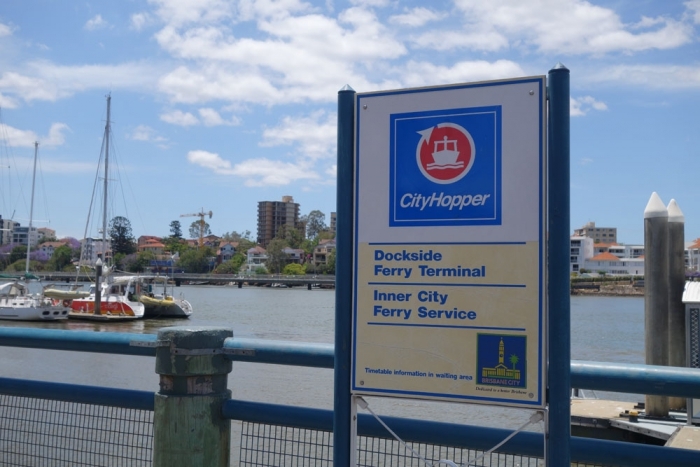 After a bit of hunting we found a cheaper space in Kangaroo Point, near a CityHopper terminal (more on that later) - I think it was called Dockside parking or something like that - which was a flat fee of $10 for all day. A great way to get around the city is a free ferry called the CityHopper which runs quite regularly (maybe every 30 mins) and operates until quite late at night, criss-crossing across the river which winds through the city centre. Not only is it a great free way to get around and save you a good amount of walking, it is also a brilliant way to see the city from the river. 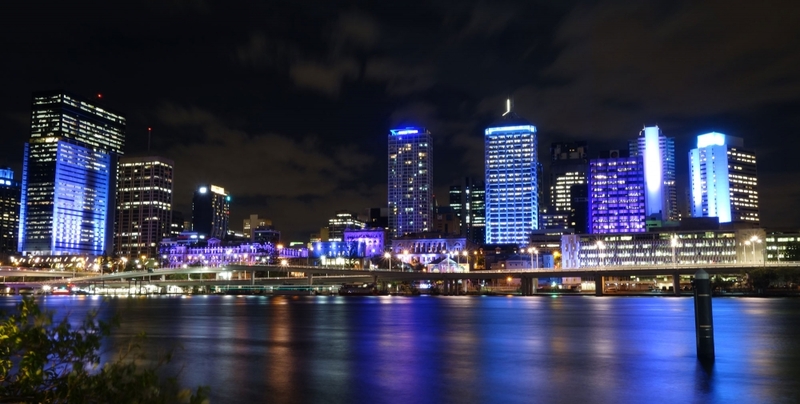 We jumped on a ferry almost right beside our car park and took a ride down to South Bank - snapping pictures along the way. 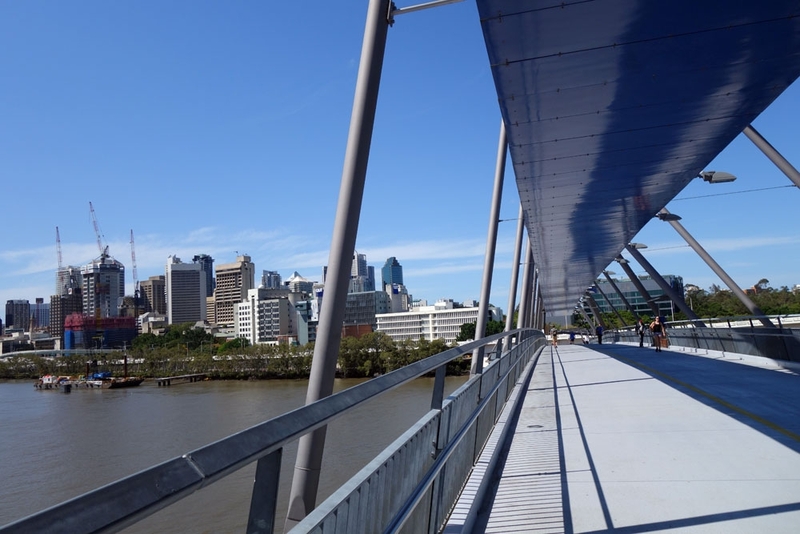 We got off the City Hopper at the Maritime Museum and walked from there towards South Bank. The walk is incredibly picturesque, with a walkway covered in pink flowers winding through gardens beside the river. The path meanders through free barbecues, cafes and water features with plenty of water fountains along the way (which we appreciated on the hot day!). An alternative route is the parallel boardwalk which follows the edge of the river round - we found it turns the walk into a great loop. 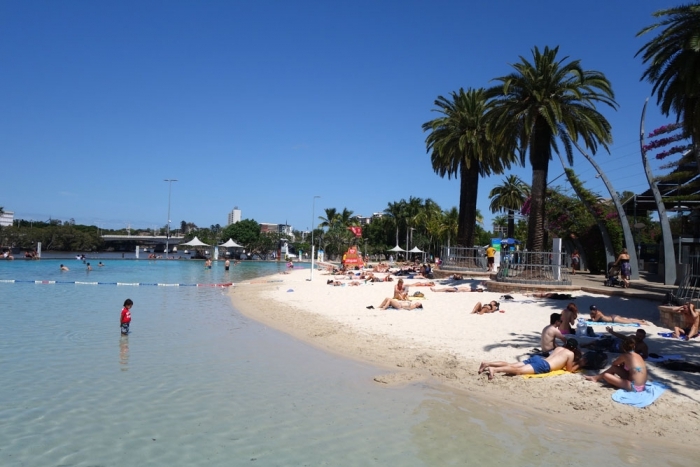 One of the main attractions of the South Bank is the artificial beach - a sandy, open-air swimming pool. It's a great centre-piece and seemingly a popular spot with the locals on a hot day like the one we visited on. As tempted as we were to jump in we only had time to dip our toes in before we headed off to our next stop. Following the boardwalk back towards the Maritime Museum, we aimed for the footbridge across the river which we could see ahead of us. From there we headed north towards the city hall, wandering through the university out of curiosity and missing what I hear is a lovely park (so maybe you should do that instead!). We dropped into a Coles Express and grabbed a lunch sitting on a bench outside the treasury. 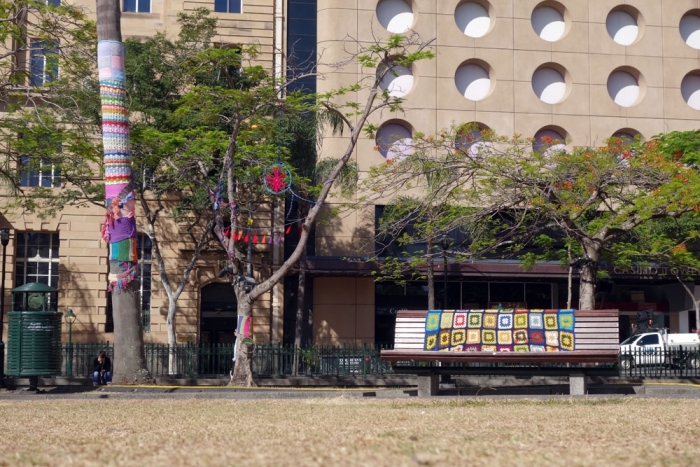 All the benches, trees and sculptures in the area had been covered in knitted fabric (or 'yarn-bombed' as the cool kids call it). They may not be there when you get there (I think it might be to do with the G20 stuff) but it added a bit more fun and colour to the city. Fed and watered we pressed onwards through a nice shopping street to the city hall. 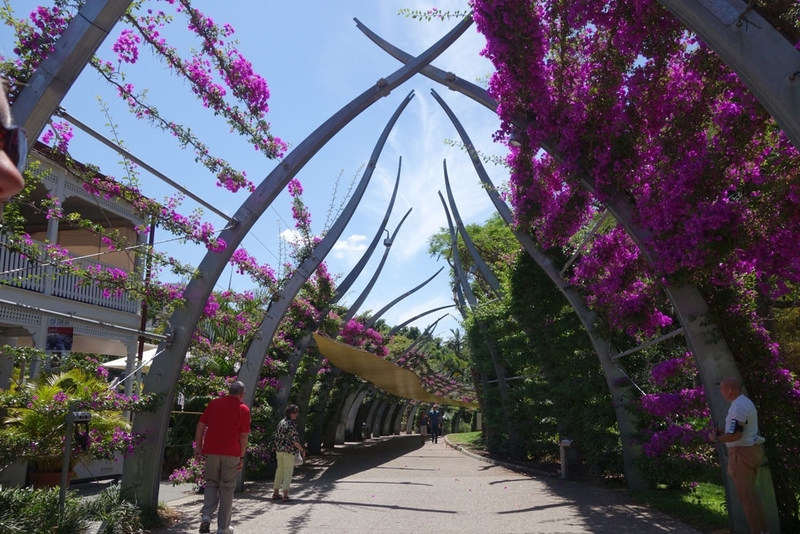 Although a little intimidating to walk into (we had to stop outside the door to make sure a burly security guard let some tourists passed without tazering them), it is really a nice place to walk through. Drop your bags off at the cloakroom beside the elevators, jump in one and head up to the museum level. There at the desk we were able to take a free tour up to the clocktower which gave some great views and plenty of information from our friendly and enthusiastic guide (when she heard we were new to the city she even gave us a quick overview of the main places to check out from the tower's vantage point which was an added bonus!). By the time we were done with the tour we had missed the final tour of the city hall itself (which is also free) but it was almost time to head back to South Bank to catch our film in the popup outdoor cinema so we weren't too disappointed. Dodging a self-righteous Anonymous rally yelling at the building from which we emerged, we only had to walk a few blocks to the river to catch a ferry back to South Bank. As the gates opened at 5:30pm we walked into the Ben and Jerry's open air cinema (tickets purchased in advance) and found a comfortable seat at the front. We'd packed our cold pasta dinner and had our Kindles with us to read while we waited for darkness to fall and the film to begin. It was a perfect temperature of an evening with no wind or rain - nice to sit out in and watch the movie (Dracula - which Lisa liked and I remain indifferent about) whose immersiveness was somewhat improved by real bats flying overhead and around the screen. 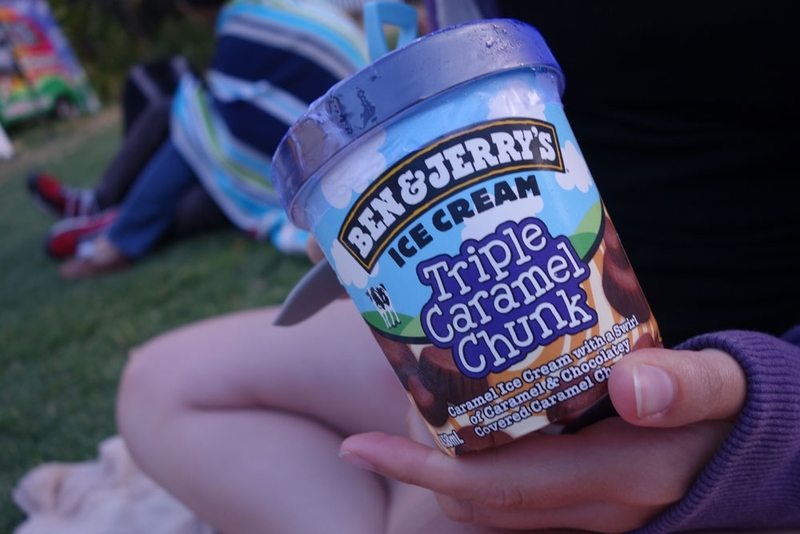 We even managed a full tub of Triple Caramel Chunk before the credits rolled! Content from a great day's exploration all that was left was a short walk to the ferry terminal, admiring the city skyline, illuminated in changing colours (again for the G20), then a 30 minute ferry ride back to the car. We were camping at a rest area by a BP garage (recommended!) only 40 minutes out of the city but after a day of walking and good food we were grateful when we finally parked up at the camp for the night.